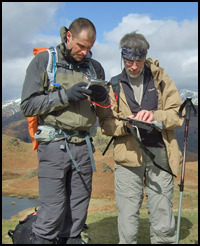 We run 1 and 2 day navigation courses for established groups. If you are not part of a group and would like to join with others then please take a look at our Hill and Mountain Skills courses. With our bespoke courses for most groups we would recommend a 2 day course which is suitable for the vast majority of people, from absolute beginners to those with previous experience or training. 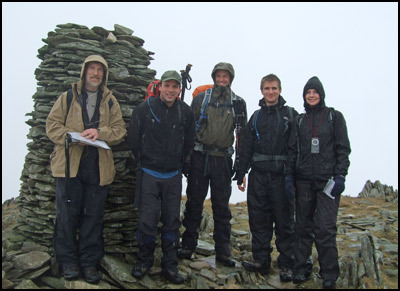 We can, of course, tailor any course to your group's specific experience and needs whether that be fair weather low level walking, mountaineering, fell and trail running etc. Those with a little more experience may wish to do our Advanced course which includes night navigation and a wild camp. We tailor these courses to individual requirements. For the most part we will be using the Ordnance Survey 1:25000 maps (which we will provide) though if you prefer to use other scales or makes then please feel free to bring them along. Navigation using linear features such as footpaths, walls and rivers. Low intensity navigation tips (how to navigate without having to look at the map and compass constantly). Navigating by using contours. Looking at types of slopes and contour features. Relocation (finding out where you are when you get lost). Using the compass to take bearings from the ground to transfer to the map. Map reading in bad weather and in poor visibility. Please come equipped for hill walking: comfortable walking boots, a full set of waterproofs, warm clothes, hat, gloves, day pack, whistle, flask (optional) and a water bottle. If you have a map of area and a compass then please bring them along though we will provide you with these if necessary. Your instructor will be carrying a comprehensive first aid kit, emergency shelter and all other essential safety equipment. If you have any questions please get in touch or use our online booking form. I've since managed to navigate myself successfully around the Tour of Pendle fell race route, a real achievement for me given that I was completely lost on that race last year... The Rab MM is this weekend in Snowdonia, so now hopefully at least I won't come last in my class!" "I got much more from it than I expected and really enjoyed doing it. I learned so much and my confidence is now much higher than it was. I’ll be taking bearings and looking at contours and features wherever I go now, even the places that I am familiar with! Ben put things across in a very easy to understand way and make it fun as well." "Jen was extremely knowledgeable, and could put across the navigation principles very well. Her keen-ness and enthusiasm for the subject were well in evidence, and this made the course very enjoyable for me. I had 100% confidence in her ability right from the start, and trusted her implicitly. Not only did I learn a lot of navigation skills, I had a great couple of days on the fells in very good company. Thanks to Jen for a really enjoyable experience. 10/10." "Andy was very friendly and easy-going.He kept the course on track, and was able to present the information clearly.If it wasn’t understood first, second or third time, he was very patient at explaining and clarifying wherever necessary." "I’m not sure how the course could be improved, it was excellent, and I am very pleased. Particular good points were the instructor’s patience and willingness to wait while I worked things out. Patience with questions, and general approachability. I always felt as though I could ask if I didn’t understand something. Andy was helpful and friendly at all times, whilst being very professional in his teaching. I would recommend Lupine to anyone interested in learning navigation skills. Thanks for a great weekend"
Andy is a great leader for a course like this - he seems quite laid back but very knowledgeable too! I liked the fact that he didn’t mind keep having to go over quite simple things. I also like the fact that the groups are small and even though I am slightly on the unfit side it wasn’t too strenuous! I had a great weekend doing this course.